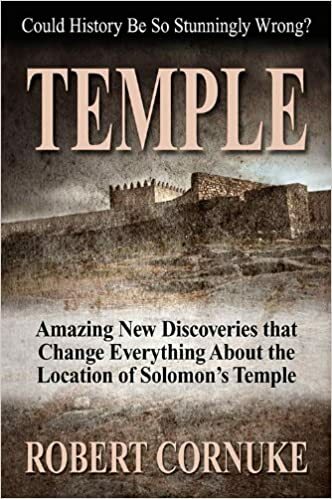 In a book that is being heralded as "an investigative maserpiece" with "astounding archaeological and prophetic implications," TEMPLE: Amazing New Discoveries That Change Everything About the Location of Solomon's Temple, by Robert Cornuke, is sending shockwaves through the Jewish, Muslim, and Christian worlds. Can you imagine the upheaval in political and religious thinking if the Temple Mount in Jerusalem is not the site of Solomon's and Herod's temples? And what if the stones of the Wailing Wall are not what tradition says? In this highly-researched, exciting book, the author proposes from current archaeological excavations and Scriptural corroboration that the true temple location is not where tradition teaches. This is must reading for anyone who wants to fit together the pieces of biblical records, current geo-polotics, and prophecy.